Bag 1: How can a design that has no visible design look so good? 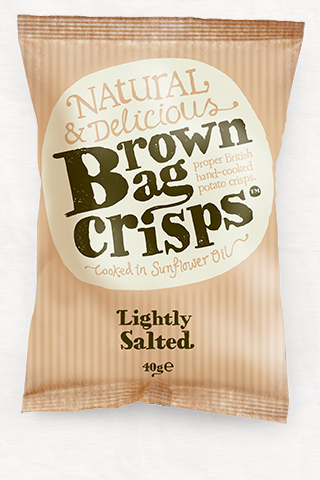 Brown Bag Crisps have the answer. Many have tried a similarly, minimalist approach, but few get it right. The brand name and the bag itself oozes freshness appeal. They even manage flavour colour coding. The writing is clear and stands out. A real shelf popper - you could not possibly miss these among their brightly coloured peers. Bag 2: We would not ordinarily include reviews of an old bag design alongside a new one, but in this case the reason for the inclusion is for comparison purposes. While we still like the latest design, it seems to be trying a little harder to achieve something the former design achieved easily. If you might find the first design in an architect's hang out on an artisan street in a trendy suburb, the 2013 design seems a little lost in the world of country fayres. It scores just as well on visibility, and it is effectively designed upon the same principles, but it seems to have replaced the cutting edge character for something that will become dated quite quickly. If anything, the move from Olive Oil to Sunflower Oil has added crunch to these Crisps. The first couple of bites were crispy and snappy. This continued for a fair while until the Crisp succumbed to its natural mushy potato state. Although these Crisps were fairly pale and colourless in the generality of Crisps colours, there were sufficient oil bubbles and irregularly shaped Crisps in the bag to add variety and character. A Nose Plunge Test revealed very little of the mysteries within. Actually, the mystery was why the flavour was different to the last bag of Brown Bag Lightly Salted Crisps we tried. The answer was in the oil used. Previously it was Olive Oil, which set them apart from peers, now it is Sunflower Oil, which is much the same as everyone else. 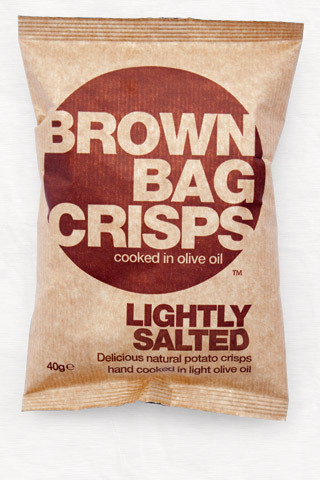 The good thing was, Brown Bag have attempted to capture the similarities in flavour, and mostly that is a very lightly salted, well oiled Potato Crisp.